Product #17944 | SKU MBPL-E-702 | 0.0 (no ratings yet) Thanks for your rating! The black E-702 PL Elements Cover from Manfrotto is a useful accessory to anyone who shoots in marginal weather. 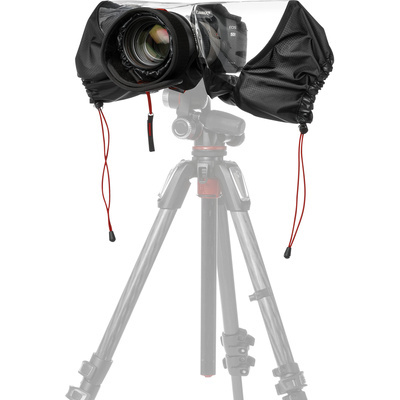 This lightweight, waterproof RipStop cover provides total protection for your DSLR with 70-200mm lens. It's easy to use and can be deployed rapidly when the weather suddenly turns sour. The spacious side sleeves give you total access to your setup and the clear TPU panels allow you to see your monitor or LCD display. There's also an adjustable, stiff hood that is designed to fit a wide variety of lenses. A double zipper is used to close the system irrespective of whether you are hand-holding your camera or using it on a tripod.